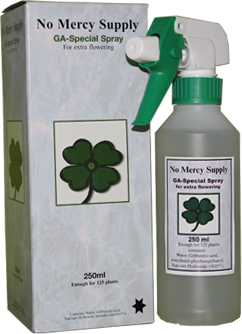 This GA-Special Spray can be safely applied to make plants bloom richer and produce more resin. This is an effect of Gibberelic-acid (a chemical produced acid, so not an hormone preparate) which stimulates the female hormones in the plant. Apply on healthy plants only, and only during the indicated period of bloom. Preferably use the spray shortly before you turn out the lights. You can also hang the light higher for a few hours. A 250 ml. 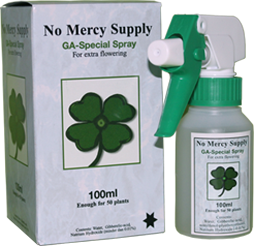 bottle of GA-Special Spray is enough to treat 125-150 plants. Spray well above the plants – do not dilute. Spray the plants once after they have been blooming for 23 – 26 days, or 23 -26 days after you have switched the lights to 12 hours. For insiders: the change from the first to the second internode flowering is the best moment for treatment. (Direct use in the barrel is possible, for info contact No Mercy Supply The results will show up rapidly. An extra week of after-blooming is necessary (adjust your nutrients, EC, watering, harvesting plans etc!). In this last week, the plant will put on more weight than in ‘regular’ situations. Some plants react better to 11 hours of light during the last two weeks. Some extreme Sativa’s may show a tendency to hermafroditism. No Mercy Supply assumes no responsibility for possible side effects due to the complex hormonal activity of this stimulator.